Jo at French Knots organised a Christmas swap back in September. 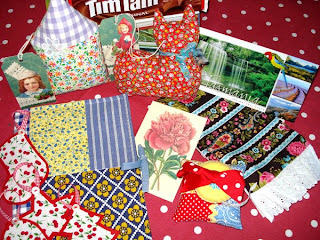 My swap partner was the delightful Kali form the colourful Tasmanian blog Poppy Lane. The idea was to make a handmade gift that took a few evenings to complete that we would send to our exchange partner. Once we had been assigned a partner we then all busied ourselves making the gifts ready to post out by out mid November. Kali and my gifts arrived on the same day... how weird is that. We both decided to wait until nearer Christmas to open them and it was worth the wait as look at all the handmade goodness that I received... Thank you so much Kali!!! Everything was beautifully wrapped in tissue paper and labelled with pretty handmade tags. Firstly I unwrapped a sweet cat softie made from the prettiest bright red floral cotton fabric and also a lavender scented house softie. I have placed both of these on the dining room mantle. They are lovely but I especially love the cat. Then I unwrapped a floral scarf a stationary wrap complete with notepad and vintage postcard. Kali also kindly sent me a tiny tape measure with a felted cover which my girls love and a perfectly stitched and very useful pin cushion. I was just bowled over by her kindness and she also sent some chocolate biscuits which the girls also have their very large eyes on. In the bottom left hand corner of the photo above you can see some festive little tree decorations too. These match perfectly with the mainly red and white theme to our Christmas tree. A departure from my usual colourful display but what with the kittens, the colourful but fragile vintage glass baubles had to be left off this year... just in case! (I did add one though high up). Christmas this year has been a fun family time, pretty low key as always but with us entertaining my family on Boxing day for the first time. All went well and although we had veg left over it was perfect as a fry up the next day. As this year draws to a close I am now reflecting on 2008. I have a book which I write all my resolutions in... It is good to look back and see the same old ones popping up time and time again... mainly... get fit! Sadly I am unfit and as the nature of my work is sitting at a computer, desk or sewing machine inside, I realise that often (apart from my mouth) I don't move much... it is hard to break out of this habit and get moving. The regular swimming fizzled out way back this year and the regular walking did not do much better. 2009 will be different. My main aim now I work at home is to spend more time growing and cultivating the garden. This is good in terms of health and thriftiness (I have been planning the veg growing these past days). I will also be slowing down, rushing less and walking more as when I do I love it. I think thriftiness is going to be our family word for 2009 and I know that many others will be looking to this way of life too. I found a great blog yesterday about downsizing which has some great info and links about being thrifty and living simply. I shall post one more time here at The Flour Loft and there is still time to leave a comment today with reference to your funniest Christmas present ever (last post) to be entered into my final Flour Loft Giveaway. Here is a final picture of the stockings that the girls made for Magic and Paws from their own designs of mice and cheese. The cats are so loved x (by all of us). Glad the swap went well! One of my Christmas presents was a rather fabulous sewing book ....perhaps you know it!! Cheerful frugality will play a big part in 2009 for me too - do you read Making Good Use, Notes from the Frugal Trenches or Down to Earth? All full of inspiring ideas, recipes and encouragment. 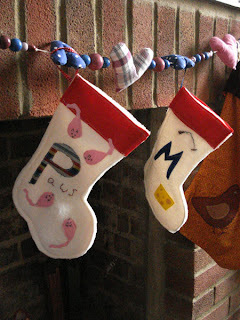 Lovely stockings - what presents did the kittens have?! 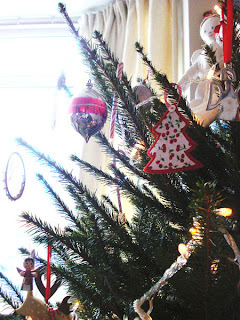 You had lovely swappy things - aren't crafty bloggers so very kind and generous? You can't stop writing. I love reading your blog! Or are you going to hop sites? I hope you don't stop writing. I never get funny christmas presents - if only - just another set of gloves or slippers (which I cannot stand wearing). I reckon I must be the easiest person to by for but unfortunately no-one around me can really be arsed to think about what I might like!!!!! Anyway, back to you - please do not stop blogging! I shall miss your posts here, I must have been reading almost since you started blogging. I think if I had written down my New Year resolutions over the last few years, getting more exercise and slowing down would have been on every list! I want to do some yoga again though I'm not sure that that counts as exercise. A very Happy New Year, Ginny, to you and your family. I'll see you over at Sweet Myrtle and in person in the New Year, I hope. Yay a new veg grower!! Oh Ginny I'll miss The Flour Loft but will still look forward to seeing your fab photographs. Just popping in to wish you all the very best for 2009! A very happy new year to you Ginny! May it bring all you could wish for and more. I'm so glad you had a wonderful christmas. Hi Ginny, happy 2009. I am glad you will still be over at sweetmyrtle...I would hate to lose touch. I am so enjoying looking at your book. All best wishes and good things to you in 2009. Hugs. Hey Ginny, My funny Xmas store is about my 16 yr old that that just spent all her money from her first job on Xmas presents, they were all wrapped and under the tree. Next morning we came out and they were all ripped into tiny pieces. My cocker spaniel had eaten them all. She told us they were expensive Lindt chocolates. My dog was a very sick boy, no more chocolates under the Xmas tree in our house. Best New Year's wishes to you. It has been grand to visit your site via the truly splendid Pipany. I look forward to seeing you at your new location. You have been spoiled with your Christmas swap I agree the cat softie is lovely. I am going to miss your posts wishing you a very happy 2009 and I'm looking forward to trying one of your projects in your lovely book! Happy New Year! What a sweet and generous parcel of delights. I particularly like the tree decorations. I had to smile at your comment about exercise ~ the only part being your mouth ~ He He!! I found that a pedometer really inspired me to get out and walk more, although in the temperatures that we are experiencing at the moment, it takes a bit more than this to get me outdoors (-20 C wind chill today!!!!) I couldn't wait to get home from work and back in the warmth. I will be sad to see The Flour Loft go, but so pleased to hear that you will not be disappearing altogether. At least it is getting warmer for a little while ! !.